Ready for a challenge? This polished puzzler will hit the spot! Play against yourself or the computer in this physics-based billiards hit! Battle against the computer’s AI and knock the most balls off of the board to win, or challenge yourself to earn a 3-star rating for using the minimum number of hits on all 160 obstacle-packed levels! 160 levels packed with different obstacles! 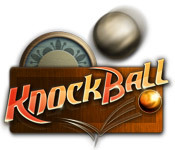 KnockBall is rated 3.3 out of 5 by 12. Rated 5 out of 5 by nnaaber from Fun Pool and Shuffleboard Game Love the games and its variations was stuck on pool for a long time but now I like the one that plays like shuffleboard the best. Rated 4 out of 5 by campingramps from Knockball is a fun game and not for intellects Those reviewers with the low ratings just don't get it. This is not supposed to be some earth shattering 5 star game. It is just a "Let's have a little mindless fun" game. It's not meant for anything but fun. True you do have to know a little physics to determine where the balls will go after they are hit and how hard to hit them but it isn't rocket science. I enjoyed this game because I like figuring where something will go after it is hit and what the consequences will be. Hey, maybe I am a rocket scientist. I recommend this one if you want something to keep you moderately interested and not overly stimulated. Let your grandkids play it, they'll zip through it in no time and make you look bad. Naughty grandkids!! Play the demo and decide for yourself but, above all, HAVE FUN!! Rated 4 out of 5 by aurorangel from Shooting pool at home without breaking windows! If you enjoy shooting pool this is a good game for you, very relaxing and fun. If you liked Zombie Bowl O Rama, you will have fun with this one as well. Rated 4 out of 5 by pennmom36 from BUMBER BALLS! This is a simple game of shooting marbles similar to playing pool. You can choose the background or board to play, and you can play against the computer or each other. You shoot the golden ball at the silver balls, the goal is to remove all of the silver balls and if the gold ball goes off the board, you have to start over. Different obstacles such as bumpers and pegs will be added as the game progresses and the number of moves that it takes you determines whether you receive one, two, three or zero stars, however you can restart the level as many times as you want when playing against the computer. I had fun playing this game but it does get a bit boring after a while. Enjoy! 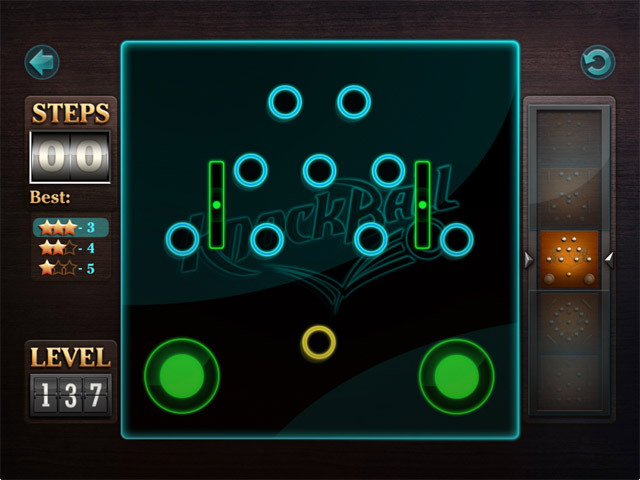 Rated 4 out of 5 by CiCiRR from If you like billiards ..... A fun game - one that requires connected brain cells. The only reason I didn't rate it higher is because the interface that pivots the cue ball is difficult to control. Almost like it's set to snap-to-grid -- it can't be fine-tuned. Resizing the "power" option arrow at the same time makes it almost painful. Rated 4 out of 5 by donadriedger from Fun I also found this game very entertaining. You need to stop and think about angles and gauge the velocity of the ball...takes a few tries to learn how fast it will roll. There seem to be a lot of levels and it got quite difficult very quickly (for me anyway...I stink at pool!) but there is a lot to challenge a player and I think lots of people will enjoy just trying to figure out the play....just basically clearing the table of all the pool balls but your own. You can play against the computer or just on your own (which I did)....lots of hours of mesmerizing fun!! Rated 4 out of 5 by lizzie1099 from Fun Game I decided to ignore the other review and try this game for myself. I really liked it. I found it quite addictive. It's a fun arcade type game and is very challenging. You can play individually or play against the computer. I like the challenge of playing against the computer.....and winning!! This game is definitely going on my "would like to buy" list. Rated 3 out of 5 by Jay61dee from Not My Mother's Pool Hall Wasn't crazy on the game. I like pool and making shots but had a tough time trying to use the cue ball...felt almost backwards to hit the shots. Rather than aiming straight with the ball, you have to pull back like a sling shot...made it difficult for me to get me shots off...and I only got to the third level before quitting !! I think others may probably like this, but reminded me of Angry Birds, Billiards style... It's worth the free download, if ya like this sorta game. Rated 3 out of 5 by Cornishwizard from Not worth the full price This is an extended version of many free versions of this game. There is a skill factor when playing against the computer, but it is too easy to cheat! If you are losing a particular round, whack your ball, so it goes off the table. You don't lose; the round just starts again! It's not a game worth paying the full price for. When it's reduced or nothing takes your fancy and you have a free game, then go ahead and get it. Rated 2 out of 5 by jopelfan from KnockBall OK for a short game. But boring after a short time. No challenge, no frills, no fun. 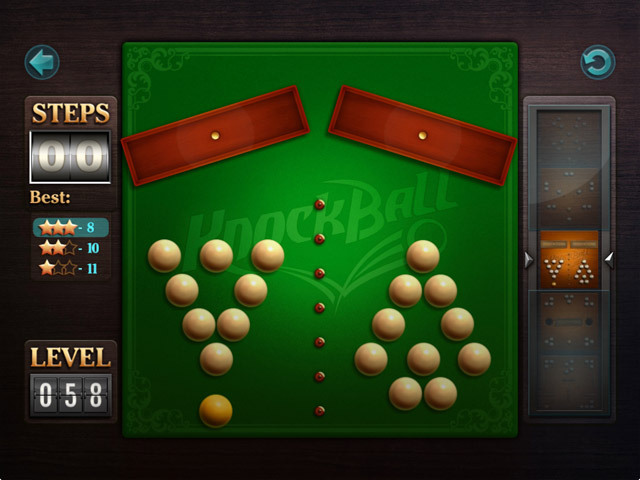 Knock all balls off the board in this challenging physics-based billiards game! Can you earn a full three-star rating on all 160 fun-filled levels?